This picture was taken by Ralph Hardy, in 1966, a Canadian tourist who intended to photograph the "Tulip Staircase" in the Queen's House section of the National Maritime Museum in Greenwich, England. 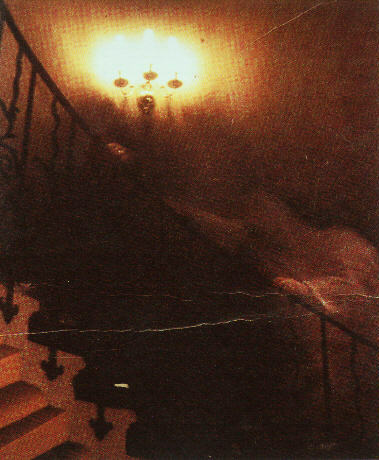 Upon development, however, the photo revealed the ghostly figure climbing the stairs, holding the railing with both hands. Many experts, including some from Kodak, could not find any evidence of tampering. Other figures have been seen on occasion in the vicinity of the staircase, and unexplained footsteps have also been heard.